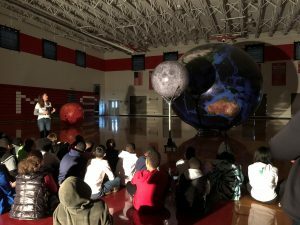 Orbit Earth Expo Visits Woodland Middle! 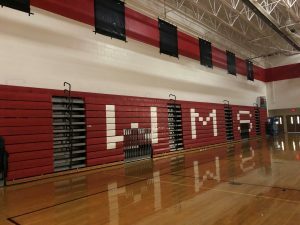 STOCKBRIDGE, GEORGIA – We always love coming to Woodland Middle School – one of the darkest gyms we can get! And you know what we love dark gyms? They make GREAT shadows! 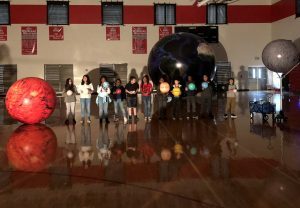 Moon phases came to life and we created solar and lunar eclipes with ease. It was a super rainy day, but it was all fun inside for an unusual day of science classes. Students really knew their stuff and had some great answers! Favorite question of the day came after we finished teaching seasons and a students asked, “Why is October the 10th month if it has “Oct” in the word that means 8?” Then we realized “Novem” means 9 in its Latin roots, and “Dec” means 10! After some research, we have an answer for that class: In the old Roman calendar, we didn’t have January and February, so there were only ten months. In 45 BC, Julius Cesar reformed the calendar and October maintained its name even though January and February were added to the calendar and the numbers all shifted! Fun Fact: in those times July and August also had numeric names, Quintilis and Sextilis respectfully. Thanks for getting us thinking on a fun topic! We had a great day with Orbit Earth Expo – see you guys in the spring with the Big Canyon Balloon!